The 1996 Chicago Bulls hold the all-time NBA mark with 72 wins. But after beating the Thunder on Saturday night the Golden State Warriors up their record to 46-4 which means if they continue this pace they'll finish with a record breaking 75 wins. While both teams are among the best of all-time they exhibit different strengths, weaknesses and styles. The Bulls plodded along at an average pace for the mid 1990’s while Golden State plays up tempo even by current standards. The Tex Winter triangle offense helped forward Scottie Pippen lead the team in assists. The Warriors leading dime dropper also happens to be a forward, Draymond Green. We know about coach Steve Kerr's two all-time great shooters but many forget that twenty years ago the Bulls also had an elite long range shooter, his name....Steve Kerr. Chicago's greatest strength on offense was holding onto the ball. Anchored by Michael Jordan the '96 Bulls sported the lowest turnover rate in the NBA. Ball control is the one area where Golden State could make improvements. Finally, both teams excelled defensively despite throwing out unconventional lineups. Steve Kerr often employs an undersized “big” to defend centers the same way that Phil Jackson would make use of Dennis Rodman's unique blend of strength, quickness and hands. all-time but Chicago has an edge on defense. To summarize both teams effectiveness on each side of the ball we look at points per possession. 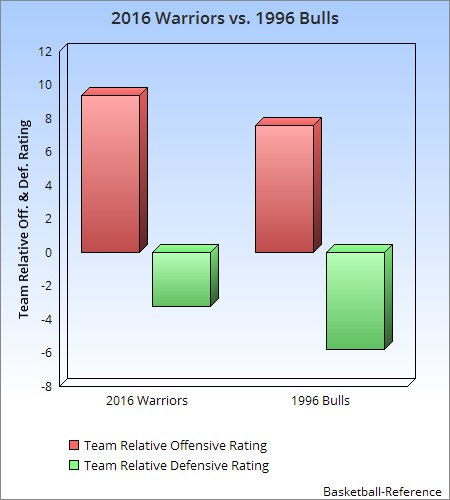 To adjust for the slightly lower scoring NBA game of 2016 “Relative Rating” is used in the chart above. This is the number of points scored and allowed per 100 possessions above or below league average. Higher is better for offense while lower is better for defense.